Is Your Developer Optimizing Your Website for Multiple Browsers? As many know, there is a wide selection of browsers to choose from when viewing the Internet. Google Chrome, Internet Explorer, Mozilla Firefox and Safari are a few of the more popular ones. Browsers come and go and each contender fights for market share. Internet Explorer had quite a cushy spot for years as the most popular browser, but now they’re playing catch up with browsers that are faster, fancier and more mobile. Some browsers, like Internet Explorer and Safari, enjoy the benefit of being pre-installed on a PC, Mac or iPad, giving them a leg up on their competition. Others, like Mozilla Firefox and Google Chrome, have fought for their right to be at the top through aesthetics and functionality. With the latest craze of content sharing, iPads and smartphones have users demanding more speed, performance and mobility. How Do These Rankings* Affect YOU? If you’re thinking of developing a website or already have one, browser compatibility should be part of your web developer’s maintenance plan. 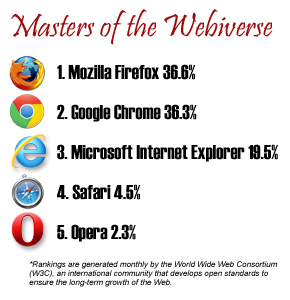 Hopefully they are keeping up with the rankings and updating your website as new browsers rise and older ones fall. They also need to physically test your site in different browsers. Some developers use an application that takes screenshots of your site viewed in various browsers. This doesn’t cut it, especially when you need to check the functionality and not just the visuals. Each browser behaves differently and not all users access the web in the same way. Because of this, the code a developer writes may not be understood by all browsers. If a developer builds a website without considering cross-browser compatibility, they could end up with a completely broken website when viewed in another browser. Something else to add to the mix is browser versions. Each browser releases new versions to keep up with the latest technologies, update security features or upgrade new features. A little known fact for most non-developer types is that Internet Explorer is probably one of the hardest browsers to develop for. Older versions of this particular browser had proprietary code that wasn’t compliant with any industry standards. They also released new versions without fixing bugs in older ones (they’re now on version 9). When Microsoft announced they were phasing out Internet Explorer 6 – we breathed a sigh of relief. Now you know a little more about what we do to ensure your website is functional and beautiful for every user. We hope this makes you want to hug us. To talk more techy fantastic-ness, fill out our contact form or call us at (915) 351-8440. *Rankings are generated monthly by the World Wide Web Consortium (W3C), an international community that develops open standards to ensure the long-term growth of the Web. You May Have Established Your Business But Have You Developed Your Brand?